New mortgage calculator widget from Coolchecks.net helps individuals assess the affordability of their next home, and businesses offer more value to their website visitors. The widget comes in a variety of colors, installs within seconds, and is offered at no cost. Estimate your monthly mortgage payments, quickly and easily. Sherry Tingley, founder of Coolchecks.net and principal writer of the website’s popular small business and personal finance blog, announced today the launch of her company’s free mortgage payment calculator widget, which is designed for two key user segments: individuals and businesses. Individuals can use the mortgage calculator to assess the affordability of a potential mortgage, and compare various terms and options. It’s a simple, quick and accurate way for individuals to keep tomorrow’s dream home from turning into a financial nightmare. Businesses, including (but not limited to) those in the financial, wealth building, real estate, and mortgage industries, can use the mortgage calculator to provide an impressive value added service to their website visitors. The widget installs easily, and can be dragged and dropped to any part of a website or blog. It also comes in a variety of color schemes (black, blue, orange, green and red) to compliment almost any design. 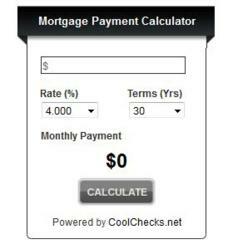 Coolcheck.net’s mortgage payment calculator widget installs within seconds, is offered in a range of color options, and is offered at no cost. The widget code, along with installation instruction, can be found on the company’s blog at http://www.coolchecks.net/blog/managing-money/mortgages/free-mortgage-calculator-widget.html.